"Amoy" redirects here. For other uses, see Amoy (disambiguation). "Emng" redirects here. For Electromyoneurography, see Electromyoneurography. This article is about the city in China. For other uses, see Xiamen (disambiguation). Xiamen (厦门) formerly known from its Hokkien pronunciation as Amoy [e˨˩ bŋ̍˨˨ ʨʰi˨˨], is a sub-provincial city in southeastern Fujian province, People's Republic of China, beside the Taiwan Strait. It is divided into six districts: Huli, Siming, Jimei, Tong'an, Haicang, and Xiang'an. Altogether, these cover an area of 1,699.39 square kilometers (656.14 sq mi) with a population of 3,531,347 as of 2010. The urbanized area of the city has spread from its original island to include parts of all six of its districts, with a total population of 1,861,289. This area connects to Quanzhou in the north and Zhangzhou in the west, making up a metropolis of more than five million people. The Jinmen or Kinmen Islands administered by the Republic of China lie less than 6 kilometers (4 mi) away. Xiamen Island possessed a natural harbor in Yundang Bay, but Fujian's international trade was long restricted to Quanzhou or to Guangzhou in Guangdong. Due to the siltification of Quanzhou's harbor, the British insisted that Xiamen be opened to foreign trade in the treaty that ended the First Opium War in 1842. Under the Qing, both before and after the war, there was a large-scale emigration of Chinese from southern Fujian who spread Hokkien-speaking communities to Singapore, Malaysia (especially in Penang), Indonesia (Medan and Riau Province) and the Philippines. The overseas Chinese continue to support Xiamen's educational and cultural institutions. As part of the Opening Up Policy under Deng Xiaoping, Xiamen became one of China's original four special economic zones opened to foreign investment and trade in the early 1980s. Its former harbor was enclosed using land excavated during the city's expansion, however, the city continues to remain an island connected by bridges to the rest of mainland China. The area around Xiamen Bay appears as Tong'an in some Han records. Xiamen Island was described as Jiahe Islet c. 976. 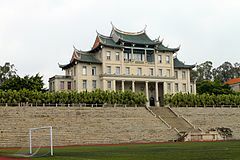 It received its present name from the Xiamen Castle erected on the island by Zhou Dexing in 1387 during the Ming. The name was formerly written using the Chinese characters meaning "Lower Gate". When its port prospered under the Qing, the name was considered unrefined and changed to homophonous characters meaning "Mansion Gate". Xiamen is the atonal pinyin romanization of the characters' pronunciation in Mandarin. It has also been romanized as Hiamen. The former English name "Amoy" was based on the same name's pronunciation in the Zhangzhou dialect of Hokkien, Ē-mûi. Xiamen was also named Siming ("Remembering the Ming") for a few years (1656–c. 1661) during its occupation by the loyalist Southern Ming forces of Koxinga. The Qing restored the former name upon their conquest of the area, but Koxinga's name was in turn restored after the Xinhai Revolution that inaugurated the republic in 1912. The name Xiamen was later restored again[when?] but Siming continues to be used as the name of one of its districts. In the 19th century, Xiamen's harbor on Yundang Bay was considered one of the world's great natural harbors. Land reclamation has since been used to fill in the mouth of this inlet, turning it into Siming District's Yundang Lake. The municipal government is located on other reclaimed land beside it. The nearest point of Liehyu in the Kinmen Islands, still controlled by the Republic of China from Taiwan, lies only 6 kilometers (4 mi) off Xiamen Island. Xiamen has a monsoonal humid subtropical climate (Köppen Cfa), characterised by long, hot and humid summers (but moderate compared to much of the rest of the province) and short, mild and dry winters. The warmest month is July, with a 24-hour average of 27.8 °C (82.0 °F), and the coolest month is January, averaging 12.8 °C (55.0 °F); the annual mean is 20.7 °C (69.3 °F). Extremes since 1951 have ranged from 1.5 °C (35 °F) on 29 December 1991 to 39.2 °C (103 °F) on 20 July 2007. Spring, both by humidity and percentage of sunshine, is the dampest season but typhoons in late summer and early autumn can make the latter period wetter overall. Summer and autumn are marked by comparatively sunny conditions, while autumn is warm and dry. The annual rainfall is 1,350 millimeters (53 in). With monthly percent possible sunshine ranging from 24% in March to 56% in July, the city receives 1,853 hours of bright sunshine annually. Frost occurs very rarely, and the last snowfall in the city took place in January 1893, when snow also fell at Guangzhou, Macau, in the inland parts of Hong Kong and in the hills of Taipei. The area is known within China for its relatively low pollution. Lai Afong's c. 1870 photograph of "Amoy" from "Koolansoo". A Krupp gun at the Hulishan Battery, installed to protect Xiamen during the late Qing era. "Hsia-men" and "Ku-lang Hsü" in a 1945 American map. Large characters saying "Peaceful Reunification" and "One Country, Two Systems" on Xiamen Island's west coast, facing the nearby Taiwanese-controlled Jinmen Islands. Similar propaganda on Jinmen face Xiamen, reading "Three Principles of the People Unite China". Gulangyu (foreground) and Xiamen (background). The area of Xiamen was largely bypassed by the Qin and Han conquests and colonization of Guangdong, which passed west of Fujian down the Lingqu Canal between the Xiang and Li rivers. It was first organized as Tong'an County in AD 282 under the Jin, but it lost this status soon afterwards. 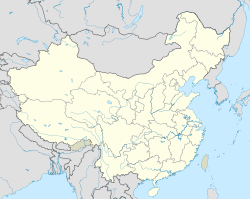 Tong'an County was again established in 933 under the Later Tang. The settlement on the southeastern shore of Xiamen Island (now part of Siming District) developed as a seaport under the Song, although legal foreign trade was restricted to nearby Quanzhou, which administered the area. In 1387, attacks by the "Japanese" or "dwarf" pirates—many of them actually disaffected Chinese—prompted the Ming to protect the harbor with the fortress that gave Xiamen its name. The Portuguese first reached Xiamen in 1541. After the fall of the Ming to the Qing in 1644, Southern Ming loyalists including Koxinga used Xiamen as a base from which to launch attacks against the invading Manchus from 1650 to 1660. In 1661, Koxinga drove the Dutch from Taiwan and moved his operations there. His base on Xiamen fell to a combined Qing and Dutch invasion in 1663. The East India Company traded extensively with the port, constructing a factory there in 1678. [a] It was raised to the status of a subprefecture in 1680, but the taxes and other restrictions placed on traders compelled the British to relocate to Canton and Fuzhou the next year. Trade resumed in 1685 and continued until the imposition of the Canton System. By the 19th century, the city walls had a circumference of around 9 miles (14 km), with an inner and outer city divided by an inner wall and a ridge of hills surmounted by a well-built fort. The inner harbor on Yundang Bay was also well fortified and these defenses were further strengthened upon the outbreak of the First Opium War. Nonetheless, Xiamen was captured in 1841 between Guangzhou and Zhoushan. Rear Adm. Parker bombarded the Qing position to little effect, but the assault by the men under Lt. Gen. Gough caused the Chinese to flee their positions without a fight. The city was abandoned during the night and fell the next day on 27 August. The Chinese had spirited out the entire treasury of sycee bullion under the nose of the British by disguising it inside hollow logs. Xiamen being too large to garrison, a small force was left to hold Gulangyu. The next year, the Treaty of Nanjing made Xiamen one of the first five ports opened to British trade, which had previously been legally restricted to Guangzhou. Subsequent treaties opened the port to other international powers. As the primary international port for Fujian, particularly Zhangzhou and its hinterland, Xiamen became a center of China's tea trade, with hundreds of thousands of tons shipped yearly to Europe and the Americas. Its local dialect influenced a variety of translations of Chinese terms. Its principal exports during the period were tea, porcelain, and paper;[b] it imported sugar, rice, cotton, and opium, as well as some manufactured goods. [c] Xiamen was also a center of Protestant missionaries in China; the missions operated the city's two hospitals. The merchants of Xiamen were thought among the richest and most entrepreneurial and industrious in China, but the city was widely accounted the dirtiest city in China. Owing to local belief in feng shui, the streets were "as crooked as ram's horns" and averaged about 4 feet (1 m) in width to keep out sunlight and control public disturbances. Its population was estimated at 250,000 in the 1870s;[d] by that point the island was largely barren and full of roughly 140 villages, with a total population around 400,000. 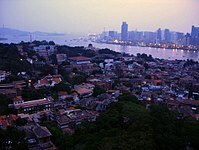 European settlement in the port was concentrated on Gulangyu Island off Xiamen proper; it remains known for its colonial architecture. A 1915 map of the "Environs of Amoy", showing the city and island before the massive land reclamation projects of the 20th century. By the 20th century, the local export economy had collapsed due to the success of British tea plantations in India. During the Qing and the early 20th century, many southern Fujianese emigrated to Southeast Asia and Taiwan, spreading Hokkien language and culture overseas. Some 350,000 overseas Chinese currently trace their ancestry to Xiamen. Some of this diaspora later returned: an estimated 220,000 Xiamen residents are returning overseas Chinese and their kin. Others continue to help fund universities and cultural institutions in Xiamen. At the time of the Xinhai Revolution, the native population of the city was estimated at 300,000 and the foreign settlement at 280. After the establishment of the Republic of China, the area around Xiamen was renamed Siming County. Xiamen's trade during the period was largely conducted through Taiwan, which had been seized by Japan during the First Sino-Japanese War. The Japanese subsequently claimed Fujian as their sphere of influence during the colonial squabbling over China. Japan occupied Xiamen Island from May 1938 to September 1945 during World War II. In the late phases of the Chinese Civil War that followed, the Communists captured Xiamen and Gulangyu in October 1949 but failed to capture Jinmen. The same year, Xiamen became a provincially administered city (省辖市). 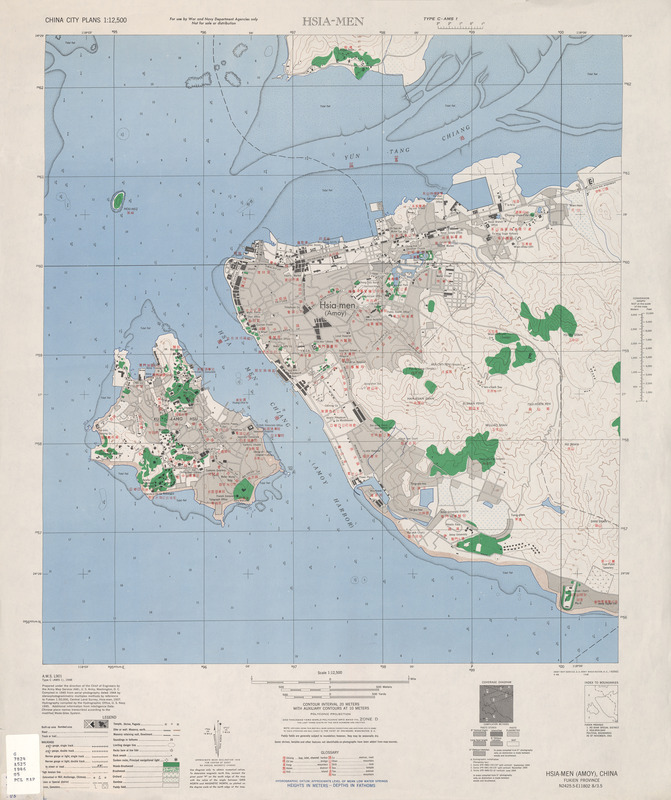 In 1955 and 1958, mainland China escalated Cold War political tensions by shelling nearby islands from Xiamen in what became known as the First and Second Taiwan Strait Crisis. The Nationalists responded by reinforcing Jinmen and shelling Xiamen. The Gaoji Causeway built from 1955–57 notionally transformed Xiamen Island into a peninsula, and so it was termed in the heady propaganda of the time. Due to political tensions, the eastern half of Xiamen Island and much of the Fujian Coast facing the offshore islands remained undeveloped in the 1960s and 1970s. The Water Police and Post-Office were situated directly across the water from the American embassy. When Deng Xiaoping initiated his Opening Up Policy, Xiamen was made one of the first four special economic zones in 1980, with special investment and trade regulations attracting foreign investment, particularly from overseas Chinese. The city grew and prospered. On 18 April 1988, Xiamen was promoted to sub-provincial status and began to be specially considered in China's state planning. In 2001, the governments of mainland China and Taiwan agreed to initiate the "Three Mini-Links" and restored ferry, commercial, and mail links between the mainland and offshore islands. Trade and travel between Xiamen and Jinmen was restored and later expanded to include direct air travel to Taiwan Island. In 2010, travelers between Xiamen and Jinmen made 1.31 million trips. In 1999, the largest corruption scandal in China's history was uncovered in Xiamen, implicating up to 200 government officials. Lai Changxing is alleged to have run an enormous smuggling operation, which financed the city's football team, film studios, largest construction project and a vast brothel rented to him by the local Public Security Bureau. According to Time, "locals used to joke that Xiamen should change its name to Yuanhua, the name of Lai's company." They subsequently claimed that potential investors were discouraged by the taint of corruption. In 2006, Xiamen was ranked as China's 2nd-"most suitable city for living", as well as China's "most romantic leisure city" in 2011. According to the 2010 Census, Xiamen has a population of 3,531,347 inhabitants, almost 1.8 times the population counted for the last census in 2000 (which was of 2,053,070 inhabitants). The annual average population growth was of 5.57% for the period 2000–2010. This masks the population explosion in Jimei District, however, which quadrupled since the prior census; Huli District's population more than doubled. The resident population was 1,967,800 in 2013 yearend, and with a population of 3.73 million (those residing at least half a year). The total resident population is said to be 4,255,000 in December 2014, without specifying what counts as a resident. The local variety is Xiamenese (also known as Amoynese), a dialect of Hokkien that is part of the Southern Min languages. Amoy dialect is widely used and understood across the southern part of Fujian province as well as overseas. 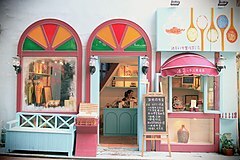 While it is widely spoken in and around Xiamen, especially by its native speakers, the Amoy dialect has no official status. The official language of all government and political business is Mandarin, although the locals do not use much of it in their everyday lives. The English words "Amoy", "tea" (茶; tê), "cumshaw" (感謝; kám-siā), "pekoe" (白毫; pe̍h-hô), kowtow (磕頭; khàu-thâu), "ketchup" (鮭汁; koê-chiap) originated from Amoy dialect. In the 19th century, Xiamen proper had two Dutch Reformed[e] and two LMS churches. Xiamen Island was home to three Dutch Reformed missions at "Kang-thau", "Kio-than", and "Chhan-chhu-oa". 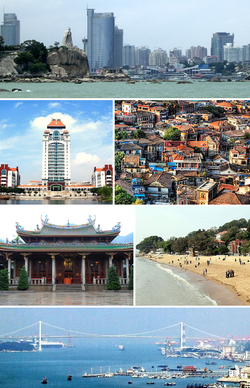 Xiamen is a sub-provincial city of Fujian with direct jurisdiction over 6 districts. In May 2003, Gulangyu and Kaiyuan districts were merged into Siming District; Xinglin District (杏林区) was merged into Jimei District; and Xiang'an District was created out of a section of Tong'an District. In 2008, a total of 356 projects with foreign direct investment had been approved in the city, with a contractual foreign investment amount of US$1.896 billion and an actual foreign investment amount of US$2.042 billion. In 1992, Xiamen was ranked among the top 10 Chinese cities in relation to comprehensive strengths with its GDP increasing by an average of over 20% annually. In 2008, Xiamen's GDP amounted to 156 billion Yuan, an increase of 11.1% over the previous year; and the per-capita GDP was 62,651 yuan (US$9,017). Further economic reforms were introduced, and this brought the total volume of imports and exports in 2008 to US$45.4 billion, while that of exports totalled US$29.4 billion. Xiamen is also the host of the China International Fair for Investment and Trade held annually in early September to attract foreign direct investment into the Chinese mainland. Xiamen also hold Straits Forum annually. Xiamen has excellent road, rail, air, and port infrastructure. In the last few years, Xiamen has invested more than RMB30 billion in infrastructure construction. Xiamen has highly developed banking services. The biggest bank is the state-owned commercial bank, Sino-foreign joint venture Xiamen International Bank, solely foreign-funded Xiamen Bank, and Xiamen Rural Commercial Bank. Various foreign banks that have established representative offices in Xiamen. There are more than 600 financial institutions in operation in Xiamen. The Xiamen Export Processing Zone is located in the south part of Haicang Development Zone only 1.5 kilometers (1 mi) from the Haicang Port Area, 10 kilometers (6 mi) from Gaoqi International Airport and 3 kilometers (2 mi) from Haicang railway station. It has a favorable geographical location and well-developed transportation network, especially sea transportation. It has a total planned area of 2.4 square kilometers (1 sq mi) with 1.46 square kilometers (0.56 sq mi) for the first phase. Industries encouraged in the zone include Biotechnology/Pharmaceuticals, Chemicals Production and Processing, Heavy Industry, Instruments & Industrial Equipment Production, Medical Equipment and Supplies, Research and Development, Shipping/Warehousing/Logistics, Telecommunications Equipment, Trading and Distribution. Xinglin Taiwan Merchants Development Zone was approved to be established on 20 May 1989 by the State Council. The planned area is 19.36 square kilometers (7.47 sq mi) and the current area is 12.5 square kilometers (5 sq mi). The zone is located in Jimei, Xiamen. The main industries set up in the zone are chemistry, machinery, textile and electronics. The zone is 8 kilometers (5 mi) from the Xiamen Gaoqi International Airport and 3 kilometers (2 mi) from the 319 National Highway. In 1992, Xiamen Xiangyu Free Trade Zone is established and approved by The State Council. The overall planning area is 0.63 square kilometers (0.24 sq mi). In 2008, there are 1100 enterprises in this park. Industries encouraged in the zone include Electronics Assembly & Manufacturing, Garment and Textiles Production, Trading and Distribution, Research and Development, Shipping/Warehousing/Logistics. The Xiamen BRT beside the main railway station. Its expressways and elevated roads form a closed network accessible only to the system's busses. The main forms of public transportation in Xiamen are buses, bus rapid transit (BRT) and the subway. Xiamen's BRT system features a dedicated bus-only closed road system with stations and ticketing system similar to light rail. Most of the 115-kilometer (71 mi) BRT network consist of bus lanes along expressways and elevated BRT viaducts on Xiamen Island. BRT routes have no traffic lights and travel speed is limited by design to 60 kilometers per hour (37 mph). Five BRT routes are currently in service: BRT-1 Route, BRT-2 Route, Huandao Avenue BRT Route, Chenggong Avenue BRT Route and Connecting BRT Route. The fare is 0.6 RMB per km for the air-conditioned busses. The BRT is supplemented by 20 shuttle bus services that connect nearby places to the BRT stations. The shuttle bus service has a flat rate of 0.5 RMB. Fare discount is available when pre-paid e-card is used. Taxis can be easily hailed in most areas of the city. Bicycles are commonly used by residents, especially on Xiamen Island. Unlike many Chinese cities, motorcycles, mopeds, tricycles, and wooden handcarts are not permitted in Xiamen. The city has upheld a ban on these vehicles since the 1990s. Electric bikes are permitted with proper licensing and obedience of traffic laws. On the small island of Gulangyu off Xiamen Island, automobiles are also banned. Xiamen Metro has been under construction since 13 November 2013 and the first line began operation on 31 December 2017. A system of five lines has been approved so far, with plans to eventually expand to eleven lines including service to surrounding suburban areas. The Fuzhou-Xiamen and Zhangzhou-Xiamen Express Highways link Xiamen with the highway network of Fujian and the neighboring provinces of Guangdong, Jiangxi, and Zhejiang. There are also container freight services available between Xiamen and Shenzhen and Hong Kong. Xiamen Railway Station's south entrance. Xiamen is served by the Yingtan–Xiamen railway, Fuzhou–Xiamen railway, Longyan–Xiamen railway and the Xiamen–Shenzhen railway, which are connected to China's national railway network. Direct passenger trains are available from Xiamen to Shanghai, Nanjing, Hefei, Fuzhou, Nanchang and Yingtan. The completion of the Xingguo–Yong’an–Quanzhou railway, Fuzhou–Xiamen High-Speed railway, Nanchang–Xiamen High-Speed railway, Longyan–Xiamen High-Speed railway, Xiamen–Shantou High-Speed railway in late 2020 expanded train services to destinations to the west and southwest. The Xiamen Railway Station on the island of Xiamen is connected to the mainland by a railway bridge. The Xiamen North Railway Station is located in Jimei District. The Xiamen East Railway Station will be located in Xiang'an District. A Boeing 737 bearing the egret livery of XiamenAir at Xiamen Airport. The Xiamen Gaoqi International Airport in northeastern Xiamen Island is a main air hub in East China with flights to over 90 domestic and international destinations. Among airports in China, Xiamen ranked the top 11 for passenger traffic, top 8 for cargo traffic and top 10 for air traffic. It can handle 27 million passengers annually. The airport is the headquarters hub of Xiamen Airlines. Xiamen has direct flights to most cities in China, Hong Kong, Macao, Taiwan, and major cities in east Asia like Tokyo, Osaka and Seoul.Intercontinental flights to Amsterdam, Sydney, Melbourne, Vancouver, Seattle(stopover Shenzhen), Los Angeles started from 2011. Xiamen also holds a strong network to southeast Asia cities like, Bangkok, Kuala Lumpur, Manila, Jakarta, Cebu and Singapore, to serve the large communities of southern Fujian's overseas diaspora and the increasing tourism flows. There are also coach bus services connecting Xiamen with Hong Kong International Airport (HKIA). Xiamen has passenger ferry services to cities along the coast of China as well as the neighbouring island of Kinmen (Jinmen) to the east, which is administered by the Republic of China on Taiwan. These ferries are all served from the Wutong Ferry Terminal to Shuitou Pier, Kinmen on the north-east side of the Xiamen Island (quite distant from downtown Xiamen), ferries to Jinmen take 60 minutes. There are facilities in both directions allowing for quick transfers between Xiamen Gaoqi Airport (for Mainland destinations) and Kinmen Airport (for Taiwanese destinations), which are very popular especially among large tour groups. While the Heping Wharf Ferry Terminal on the south-west side of Xiamen Island offers short 5 minute boat rides to the island of Gulangyu, this ferry is only accessible by Xiamen residents. Tourists and non-locals must now take a longer 20 minute ferry ride from the main International Ferry Terminal, also called the Dongdu International Terminal, on the south-west side of Xiamen Island, as of 20 October 2014 with a fare increase from 8RMB to 35RMB. The purpose was to reduce the number of tourists accessing the island in an effort to conserve it. This terminal used to have ferries, taking 90 minutes, to Kinmen Island but were ceased in 2014. The headquarters of the Xiamen Port administration. The historic port of Xiamen in Yundang Bay on the southwest side of Xiamen Island has been converted into a lake by land reclamation projects. The present-day Port of Xiamen lies on the northwestern shore of Xiamen Island, opposite its airport, and at eleven other sites around Xiamen Bay and along the Jiulong estuary, including the neighboring jurisdiction of Zhangzhou. The port facilities are interconnected by ship, road, and rail. The port has been one of the busiest in China since the early 1980s and is serviced by all of the 20 largest shipping lines in the world. In 2016, Xiamen ranked among the top 15 ports in the world for container freight. The natural coastline in the port area is 64.5 kilometers (40 mi) while the water is over 12 meters (39 ft) in depth. There are 81 berths, including 16 deep-water berths, of which 6 operate containers of over 10,000 tonnes. Among other cargoes handled, Xiamen is the world's largest supply base for raw tungsten materials and sunglasses, exporting 120 million pairs each year. Xiamen is also an important base in Fujian province for making medium-sized and large container vessels and yachts. Xiamen and its surrounding countryside is known for its scenery and tree-lined beaches. Gulangyu, a former treaty port enclave, is a popular weekend getaway with views of the city and features many Victorian-style buildings. Xiamen's Botanical Garden is a nature lover's paradise. 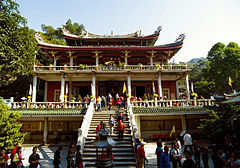 The Buddhist Nanputuo Temple, dating back to the Tang Dynasty, is a national treasure. Xiamen is also well known as a continuing frontline in the Chinese Civil War, with the nearby Jinmen Islands remaining under Taiwanese control. Water Garden Expo Park has a total area of about 6.76 km2 (2.61 sq mi), with a land area of 3.03 km2 or 1.17 sq mi consisting of five exhibition park islands, four ecological landscapes islands and two peninsulas, including the main pavilion, Chinese Education Park, Marine Culture Island, Spa Island, and other functional areas and related facilities. Xiamen is famed for its music, puppet shows, Gezi Opera, and temple celebration events. As with much of southern China, the staple foods of Xiamen have long been rice, seafood, pork, sweet potatoes, various pickled vegetables, and bok choy. Its traditional dishes form a branch of southern Fujianese cuisine, with Taiwanese influence. It is particularly well known within China for its street food and snacks. A local specialty is worm jelly (t 土笋凍, s 土笋冻, tǔsǔndòng), a gelatin made from a kind of marine peanut worm. Many famous Chinese musicians hail from Xiamen and Gulangyu Island, including Huang Yujun, Yin Chengzong, Jing Yang, and Xu Feiping. It has a major symphony orchestra, the Xiamen Philharmonic Orchestra. Every May there's an international music festival, and piano competitions and music festivals are also frequently held. On Gulangyu, on Huangyan Road on the way to Sunlight Rock is the Gulangyu Concert Hall, where classical concerts are regularly held on weekends. Xiamen Wushipu oil painting village has been named as “the second of the world oil painting industry base” and the second batch of national cultural (art) industry base” by the China artist association and the culture property department of Culture Ministry. Xiamen has strong industry advantage in hand-done oil painting, which has two main manufacturing bases here, Xiamen Wushipu Oil Painting Village and Xiamen Haicang Oil Painting Village. 80% market shares in European and American market is taken up by products exported from Xiamen. As the main manufacturing base of hand painted oil painting in China, Xiamen Wushipu Oil Painting Village has more than 5,000 artists. It has the ability to produce all kinds of oil paintings with different specifications and styles. With the support of Xiamen Municipal Government, it has formed a powerful industrial chain, provided related accessories such as frames, brushes and paint colors and formed stable target customers composed by hotels, villas, high-class departments, galleries and so on. As another mail manufacturing base of oil painting, Xiamen Haicang Oil Painting Village has more than 3,000 painters. The scale of Xiamen Haicang Oil Painting Village has developed rapidly in recent years, which is from originally 28 enterprises to more than 250 enterprises at the moment. The combination of manufacturing, sales and distribution makes it become industrial base of commercial oil painting. Xiamen is served by Xiamen Media Group, which broadcasts news and entertainment such as movies and television series by AM/FM radio, close circuit television, and satellite television. Media in Xiamen were temporarily blocked by the Government in June 2007 when about 10,000 people participated in protests against the building of a paraxylene factory by Tenglong Aromatic PX (Xiamen) Co. Ltd., which is owned by Taiwanese businessman Chen Yu-hao. The incident, however, was solved smoothly later that year. The first two universities below were founded by Tan Kah Kee. Xiamen functions as the headquarters of the 73rd Group Army of the People's Liberation Army, one of the three group armies under the Nanjing Military Region, which is responsible for the defense of the eastern China, including any military action in the Taiwan Strait. Tan Kah Kee, businessman, community leader, and philanthropist in colonial Singapore, and a Communist leader in the People's Republic of China. Walter Houser Brattain, American inventor of the transistor; co-recipient of 1956 Nobel Prize in Physics. Singapore, Philippines and Thailand have the consulates in Xiamen. ^ The factory represented an investment of $30,000 in bullion and $20,000 in goods. ^ For 1870, 314 British and 240 other foreign ships cleared the port with £1,144,046 of exports, apart from the domestic traders. This had fallen to £384,494 by 1904. ^ For 1870, 315 British and 245 other foreign vessels entered the port with £1,915,427 of imports, apart from the domestic traders. For 1904, the figure was £2,081,494. ^ The estimate is very rough. Pitcher, writing a little later, placed the town's population at 60–100,000. ^ The churches bore the names "Sin-Koe-a" and "Tek-Chhiu-Kha". ^ "Communiqué of the National Bureau of Statistics of People's Republic of China on Major Figures of the 2010 Population Census (No. 1)". National Bureau of Statistics of China. 28 April 2011. Archived from the original on 8 November 2013. Retrieved 12 February 2014. ^ Formerly "Lower Gate" (下門); see Name section. ^ "Hot Terms in China's Reform". CRI English. 31 October 2008. Retrieved 17 August 2018. ^ Zhongguo Gujin Diming Da Cidian 中国古今地名大词典, 2855. ^ Pitcher (1893), p. 26. ^ 《环球时报》2002-04-22. .china.com.cn. Retrieved on 28 August 2011. ^ Wile, Rob. "These 10 Cities Are Your Best Bet At Escaping China's Epic Pollution Problem". Retrieved 17 July 2016. .
^ a b c d e f g h i j EB (1878). ^ Struve, Lynn A. (1984), The Southern Ming 1644–1662, New Haven: Yale University Press, p. 181 . ^ a b c d Pitcher (1893), p. 31. ^ a b c Pitcher (1893), p. 32. ^ Ouchterlony (1844), pp. 173 ff. ^ Pitcher (1893), p. 33. ^ Ouchterlony (1844), p. 176. ^ Pitcher (1893), p. 30. ^ a b c d Pitcher (1893), p. 27. ^ Cheung, David Yiqiang (2004), Christianity in Modern China: The Making of the First Native Protestant Church, Leiden, pp. 205 ff . ^ a b c Pitcher (1893), p. 28. ^ Pitcher (1893), p. 34. ^ Pitcher (1893), p. 29. ^ a b Pitcher (1893), p. 25. ^ Wright, G.N. (1843), China, in a Series of Views, Displaying the Scenery, Architecture, and Social Habits of That Ancient Empire, Vol. II, Fisher, Son, & Co., p. 69 , illustrated by Thomas Allom. ^ Morrison, George Ernest (c. 1870), Album of Hongkong, Canton, Macao, Amoy, Foochow, p. 50 . ^ Thomson, John (1898), Through China with a Camera, Westminster: A. Constable & Co., p. 96 . ^ An Official Guide to Eastern Asia, Vol. IV: China, Tokyo: Imperial Japanese Gov't Railways, 1915 . ^ Beech, Hannah (28 July 2014). "Smuggler's Blues". Time. Retrieved 28 July 2014. ^ Jing Fu (3 January 2006). "Beijing drops out of top 10 'best city' list". China Daily. Retrieved 25 April 2012. ^ Daily, Xiamen (4 November 2011). "Xiamen dubbed 'Most Romantic Leisure City'". Xiamen Daily. Archived from the original on 6 March 2012. Retrieved 22 June 2012. ^ "China: Fújiàn (Prefectures, Cities, Districts and Counties) - Population Statistics, Charts and Map". www.citypopulation.de. ^ "Floating population in Xiamen reaches 2.07 million - What's On Xiamen". www.whatsonxiamen.com. ^ "Report shows Xiamen population reaches 4.255 million in 2014 - What's On Xiamen". www.whatsonxiamen.com. ^ 中央机构编制委员会印发《关于副省级市若干问题的意见》的通知. 中编发5号 (in Chinese). 豆丁网. 19 February 1995. Archived from the original on 29 May 2014. Retrieved 28 May 2014. ^ Xiamen Export Processing Zone | China Industrial Space. Rightsite.asia. Retrieved on 28 August 2011. ^ Xiamen Haicang Taiwanese Investment Zone. RightSite.asia. Retrieved on 28 August 2011. ^ Xinglin Taiwan Merchants Development Zone. RightSite.asia (20 May 1989). Retrieved on 28 August 2011. ^ Xiamen Torch Hi-Tech Industrial Development Zone. RightSite.asia. Retrieved on 28 August 2011. ^ Xiamen Xiangyu Free Trade Zone. RightSite.asia. Retrieved on 28 August 2011. ^ "Xiamen cracks down on electric bicycle traffic violations – What's On Xiamen". www.whatsonxiamen.com. Retrieved 31 August 2016. ^ a b c d "China Expat city Guide Xiamen". China Expat. 2008. Retrieved 8 February 2009. ^ a b "China Briefing Business Reports". Asia Briefing. 2009. Archived from the original on 18 February 2009. Retrieved 8 February 2009. ^ "Mainland Coaches." Hong Kong International Airport. Retrieved on May 8, 2018. "Services are available at the Coach Station of Terminal 2 for travel to destinations such as [...] Xiamen via different cross-boundary land control points." ^ Pitcher (1893), p. 38. ^ Cody, Edward (28 June 2007). "Text Messages Giving Voice to Chinese" – via www.washingtonpost.com. Baynes, T.S., ed. (1878), "Amoy" , Encyclopædia Britannica, 1 (9th ed. ), New York: Charles Scribner's Sons, p. 748 . Chisholm, Hugh, ed. (1911), "Amoy" , Encyclopædia Britannica, 1 (11th ed. ), Cambridge University Press, p. 878 . Ouchterlony, John (1844), The Chinese War, London: Saunders & Otley . Pitcher, Philip Wilson (1893), Fifty Years in Amoy or A History of the Amoy Mission, China, New York: Reformed Church in America, ISBN 9785871498194 . Ng, Chin-Keong (1983). Trade and Society, the Amoy Network on the China Coast, 1683–1735. NUS Press. ISBN 978-9971690694. Retrieved 24 April 2014. Wikimedia Commons has media related to Xiamen. This page was last edited on 5 April 2019, at 12:10 (UTC).